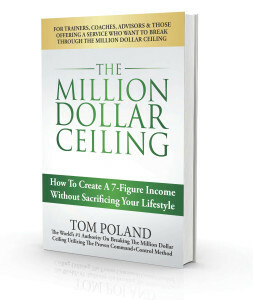 The Million Dollar Ceiling is not an e-book but a real, physical, block buster book of 270 pages and it’s loaded with a simple, proven method that will empower you to help more people and generate more revenue, in less time. In it you’ll discover how it’s now relatively easy for even a “solopreneur” to break the million dollar ceiling whilst enjoying the sort of freedom, choice and quality of lifestyle previously unachievable by all but super stars. If you offer a service or advice for a living then this book could literally be worth millions of dollars to you as I pull back the lid on how I’ve helped generate tens of millions in revenue for my clients and for my own businesses (click here for validation of that claim).